If Moscow wants its Syrian allies to skirt the blame for chemical attacks, they’re going to have to come up with some better evidence than a few beakers and boilers in a dingy basement. Russia and Syria say the alleged chemical weapons attack in Douma, Syria was all a rebel-staged fake— and promise that they’ve got the evidence to prove it. But one of the pieces of evidence they say shows a secret rebel chemical weapons lab shows nothing of the sort, experts say. At the center of the claim is a building in Al-Shifuniya, in East Ghouta where the Syrian military says it found “a chemical warehouse used to manufacture chemical weapons against the Syrian Army” and a “research lab for experiments” run by the Islamist militant group Jaish al Islam in mid-March. The allegation tracked with an uptick in Russian claims about a rebel chemical weapons “false flag” in the making shortly after the Trump administration was considering military options to respond to the Assad regime’s alleged use of chlorine gas in early 2018—including an alleged February 25 chlorine attack on Al-Shifuniya itself. Since Syrian state TV ran videos of the facility, Russia’s state-backed media outlet RT has amplified the story, calling the Al-Shifuniya site “a well-equipped chemical laboratory run by Saudi-backed Islamist terrorists” and the left-leaning Salon columnist Patrick Lawrence has cited the piece approvingly. Videos of the Al-Shifuniya facility show fliers with the logo of Jaish al-Islam, one of the Islamist militant groups that held control of the the northeast Damascus suburbs. The videos also show equipment seemingly from commercial companies, like an air plant marked as the product of Hill-Rom, a medical device maker, a large metal container with a “Flainox” label, the name a fabric dyeing equipment firm, as well as several boiler-like metal containers in the basement. Experts say it’s not clear what the facility in question was used for, but they are convinced that it couldn’t have been used to produce either the chlorine gas or sarin nerve agent that many believe were used in the fatal attack in Douma which prompted the U.S., France, and the U.K. to strike Syria on Friday. Chlorine is typically produced with electrolysis cells using either large amounts of salt or hydrochloric acid as feedstock and lots of electricity to produce and recover the gas. And this facility isn’t anywhere near “the scale needed for the attacks that have been observed,” Rofer wrote in an email. “All of the equipment, except for the boilers, is at laboratory scale. 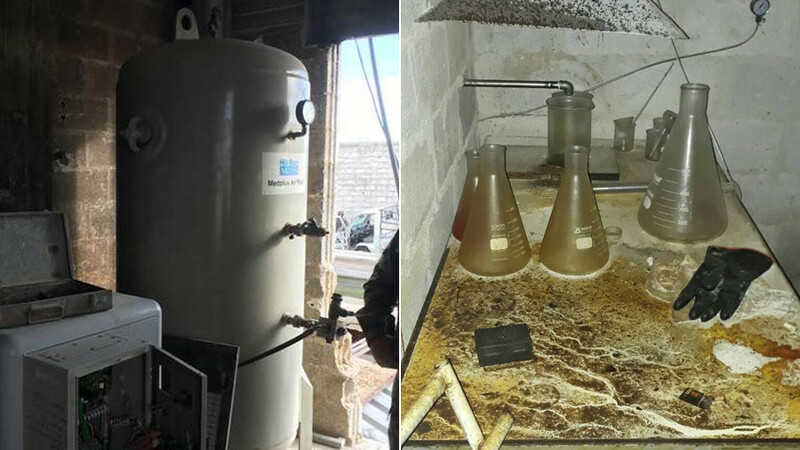 But the more fundamental problem is that none of the equipment is what is needed to produce chlorine and compress it into the cylinders that [investigative journalism outlet] Bellingcat has documented” in Douma. Syrian military personnel also pointed to presence of allegedly Saudi chemistry textbooks and a poster as evidence of a foreign hand in the purported chemical weapons facility. As a Syrian military officer points out in the video, a poster with a list of chemicals on it bears the title “The reality and horizon of the Saudi Chemical Industry.” It’s unclear where the poster come from or what it depicts, but it shares the name of a report on Saudi Arabia’s chemical industry produced by the Saudi Consulting House. The Al-Shifuniya facility also showed some limited evidence of conventional homemade explosives (HME) production. Items listed on a whiteboard in videos of the facility include perchlorate, aluminum powder, nitrocellulose—chemicals normally associated with HME and rocket propellant—as well as “PETN,” an acronym for pentaerythritol tetranitrate, a common HME in militant improvised explosive devices (IEDs). “These are used to prepare explosives,” a Syrian officer explained in the video, claiming the explosives are mixed with chemical weapons. Aluminum powder, often used in the production of ammonium nitrate and aluminum explosives, and nitrocellulose are frequently traded by would-be bomb-makers in rebel arms markets in Idlib province in northwest Syria. Still, while the compounds written on a board are often associated with HME, the facility itself doesn’t appear consistent with other IED factories used for churning out large amounts of bombs. “The blue and yellow jugs are traditional IED main charge containers in Iraq/Afghanistan/Syria etc. But I’d expect bulk quantities of fertilizer, sugar, etc if they were making lots of HME, and I don’t see that. No wires, batteries, caps, triggers, etc to make IEDs,” Brian Castner, a former U.S. Air Force Explosive Ordnance Disposal officer and an Iraq War veteran, wrote in an email. But perhaps the oddest thing about this Moscow-Damascus push to tie chemical attacks to a particular lab is how unnecessary it all is. Chlorine is a widely-used industrial chemical, after all. And reports by the UN’s Joint Investigative Mission, charged with investigating allegations of chemical weapons use, has noted that chlorine “is available to all parties in the Syrian Arab Republic.” Russia could’ve easily stuck to hiding behind the—admittedly thin—rhetorical shield of chlorine’s availability. Russia and Syria have tried, time and again, to push a storyline that rebels have carried out false flag chemical attacks with secret stashes of foreign-supplied weapons. It hasn’t helped Damascus wriggle out of responsibility for previous chemical weapons attacks before, as a handful of UN investigations show. If Moscow wants its Syrian allies to skirt the blame for the alleged chemical attack in Douma, they’re going to have to come up with some better evidence than a few beakers and boilers in a dingy Ghouta basement. Adam Rawnsley is a Philadelphia-based reporter covering technology and national security. He co-authors FP’s Situation Report newsletter and has written for The Daily Beast, Wired, and War Is Boring. You can follow him on Twitter at @arawnsley. So, they made bombs in an apartment room in Belgium, but they would not be able to produce Chlorine!? I produced Chlorine during my studies. It requires very basic tools + refrigerated water to disolve it. Really Chlorine can be produced easily believe me. Btw, my study direction had nothing to do with chemical research, it was a mandatory course in the first year, part of the trunk. The challenge is the amount, not the method. It’s interesting that Adam Rawlsley ignores the fact that the only actual chlorine manufacturing plant in Syria was in rebel hands from late 2012 until late last year. Whatever that lab was used for, the rebels would not have needed it for mass production of chlorine. How to best stop OPCW if not by creating security issues? Was there urgency to bomb? No. It just helped delaying the OPCW and eventually, when nothing will be found they’llssy it is no longer reliable… we know the script already. Douma was not bombed by US+co. But not sure if the bombing had any positive effect on Assad behavior for future. I would not allow U.K. there at all, after they didn’t admit Russia to the investigation in Salisbury, after they bombed Syria before any investigation could even have started. They are not an independent party. Aren’t there other countries which didn’t participate in the invasion, Germany, Italy e.g. Also OPCW was supposed to be international, why do we see a national U.K. delegation under OPCW flag? Anyway it seems strange that OPCW was granted visas and admitted to Damascus, but not Douma. US stated that they stoke Syria before the investigation because Syria allergedly didn’t grant the OPCW visas. That was proven to be untrue. The current issues must be some temporary technical difficulties too. OMG, one more newby with a good nose… if you are really interested in this question, would you mind looking into Jewberg article’s comment section below, where I tried to answer your question, at least with regards to my humble persona. Because if Russians did to U.K. delegation what U.K. did to Russia. That is didn’t allow Britain experts as U.K. didn’t allow the biological samples and refused Russia to take part in the investigation in Solisbery, but started a coordinated media and political attack to Russia instead, trying to unite as many European countries as they could to form a single anti Russian front just before the invasion to Syria. That would be fare and fully justified if Russia and Syria didn’t allow UK to Douma. But Russia would have clearly stated so. I don’t think they would. It is very rare that Bellingcat is right about something, but it is clear that these are IED factories. Stated another way, those who jumped to the conclusion that this was a chemical weapons lab were either a) dishonest, b) ignorant, or c) willfully ignorant and rushing to conclusions without critical thinking. Somehow they got killed, that’s for sure. We want to know, how. it sounds like Douma got liberated. Interesting, though, that the White Helmets, funded in part by Foreign Office, chose to leave the town with the Jaish el-Islam busses. Makes you think, no? Not really. Russian/Assadist propaganda has made it clear that they consider the White Helmets to be terrorists. They’ve been targeting them in double-tap air strikes. To stay would be brave to the point of foolhardy. Maybe. Also, I’ver never seen the WH post an image of the prisoners digging those tunnels under Douma, and how they die. And of those poor sods the Army of Islams chooses to behead b/c they’re associated /w Assad. They were delayed by small arms fire from unknown persons that inured one of the soldiers guiding the OPCW. The safety of the investigators is very important. One of the doctors on duty at the hospital where the victims had gone to during this alleged attack said the victims were suffering from lack of oxygen from choking on the large amount of dust and soot from exploding buildings nearby. He also said that they weren’t displaying symptoms of a chemical weapons attack, and if they were, their presence in the hospital would have affected the medical staff also because no one was wearing a full body suit. Remember that those who are fueling this conflict USA, saudi Arabia, Qatar, and Turkey by training 50,000 mercenairies for urban combat,armingthem, and providinglogistialsupport are using propaganda to demonize the ‘enemy’ assad. It is classic propaganda where women, children, and babies are beinig targeted by Assad, and that Assad is the guilty one for defending his country against a foreign backed violent attempt to overthrow the government. It is the aggressor who is responsible for the dead. If these aggressor countries hadn’t done this action, 500,000 people would be alive today and the cities wouldn’t have been reduced to rubble. It is also a violation of international law to do violent regime change without a UN mandate. Does any one seriously think that Saudi Arabia wants a democratic Syrian state when the groups they support hate democracy? Holding up a protest sign Saudi Arabia will cost you your head. Remember the Germans were eating babies in WW1, and the Iraqi soldiers were killing babies in the incubators in Kuwait, 1991-Propaganda. The buck stops with the head of state. The present war is a direct result of Baathists failed policies in Syria. The doctors made statements under duress. “Choking on dust” is not a credible explanation for the mass deaths. Use your brain. I am observing a marked increase in coordinated posts from Russia. Release the trolls… Anyone is seeing this? It’s easy to identify the Russky trolls by their convulated, confused, messy, agressive, irrational posts. Thanks to Trump, the honeymoon with the “new”, “post-communist” Russia is over! Get ready Russia! No. I am an American who doesn’t believe everything he hears. Calling people names means you can’t refute the facts presented. Russians to this day can’t even acknowledge the massive state-sponsored doping of their athlets in Sochi. Russians are pathological liars! Where are you from, a racistic moron? Your name is resolved to Brazil on Facebook. But you remind me so much an old familiar Ukrainian troll rethoric. Oh, look who’s NOW is racistic! The thing is, Mr. Araldi, that both sides are on record for lying. Russia was found innocent of a state sponsored doping program. Do your homework first. You would think that the Kremlin’s leaders would eventually get sick and tired of their own lies but evidently it’s a pathological situation where the truth is , possibly , something only experienced in a deep and disturbing dream….on the one hand one feels terribly sorry for people who are so far removed from reality but on the other hand they are dangerous to the health of our planet and too stubborn to seek psychiatric help…. I wonder how many prisoners died digging the tunnels under Douma for Jaysh al-Islam? And what the White Helmets did to help them? Also, it’s obvious civilians are being used as human shields in Douma, which seems ok with the FO. Unfortunately you are right. All parties in this Syria war have lost all decency and civilization. – In this cynical sense the use of a chemical substance heavier than air is the most effective way to “clear” these tunnels, if not the only one. You must be speaking about Trump. Putin is very respectable and more credible than Trump. Listen to both of them and check their facts. No, this is based on multiple reports from the medical people at Douma hospital who treated the victims for bombing related hypoxia. , until recently, able to maintain some communication, can no longer contact them and are now sick with worry. The fear is that the terrorists have gone on a killing spree before scurrying away to the north. The White Helmets have thrown all the helmets into a corner, and and put on running shoes instead. Hypoxia does not cause foaming at the mouth or corneal burns, as doctors reported before they fell under regime pressure. It sometimes seems like we are talking about abstracts here so it is interesting to see the facts on the ground. Regardless how you produce Chlorine, you’ll always have the problem of handling a highly toxic and corrosive gas in large quantities. Also Chlorine will liquefy at around 7 Bar pressure and 20C ambient temperature when pumped into a container. You don’t need high pressure containers. You can see this in the pictures of ruptured “Chlorine-Bombs” – the gas cylinders look like thin-walled propane tanks. The ONLY problem is: You’ll need a compressor/pump to put the gas in to a pressure container and this can’t be done with an average industrial/diy machine. It will start to be corroded and possibly burn within a matter of seconds. You’ll need highly specialised machinery. Did ever hear about DIY electroplating? This isn’t really relevant. I produced chlorine this way over a dozen times as a kid in my backyard. I even bent over to breathe it in (curiosity). It’s not going to kill you. You’ll never produce sufficient quantities this way. Thanks for stopping over Claire!